Unfortunately parasites are everywhere all the time! Whether your Cat is an indoor only, comes in and out or stays outdoors all the time, he or she comes in contact with nasty worms daily. Cat's are usually full of parasites because they groom themselves by licking, thus they can ingest the worm larvae and a cycle begins. They can also get them from ingesting an infested rodent and also from other infested Cats feces. Round worms are usually the most common in Cats, however they can get a large variety of parasites. These nasty things can reek havoc on your Cat's immune system and also cause many other complications, such as infection. Parasite infestation can be hazardous to your Cat but also to you as well. Roundworms look like spaghetti strings, usually adult worms can be up to 3 to 4 inches long. Kittens can get these worms by an infected Mother's milk, Cat's can get these worms by an infected rodent or by the feces of an infected Cat. Hookworms feed on the Cat's blood supply and can cause anemia, which can be life threatening to Kittens and older Cats they are generally about an inch long and live primarily in the small intestine. Hookworms are more common in Dogs than Cats, but households that have both are at risk. Hookworm eggs are passed through the stool and also the skin, so they can easily be picked up. Tapeworms are also a big problem with Cat's. They can range any where from 4 to 34 inches long and are flat. These nasty worms can cause vomiting and weight loss. Tapeworms are passed by ingesting a host, such as an infected rodent, however the most common way is by ingesting infected fleas. When a Cat is infected with tapeworms, you can actually see worm fragments that resemble rice around your Cat's behind or in their bedding. So are some Cat's more prone to worms that others? The answer is yes, if your Cat is strictly an outdoor Cat, or indoor/outdoor his or her chances are better, but don't rule out worms in strictly indoor Cats either. As said above they can get worms from infested rodents, so if you indoor Cat catches a mouse in your house, chances are good that mouse is infested, also if your indoor Cat picks up fleas they usually host tapeworms. Humans can get infested with worms too, living closely with an infested Cat increases your chances of becoming infested too, especially children who put their fingers in their mouth more than adults. It has been said that more than 10,000 Children a year become infested with roundworms. 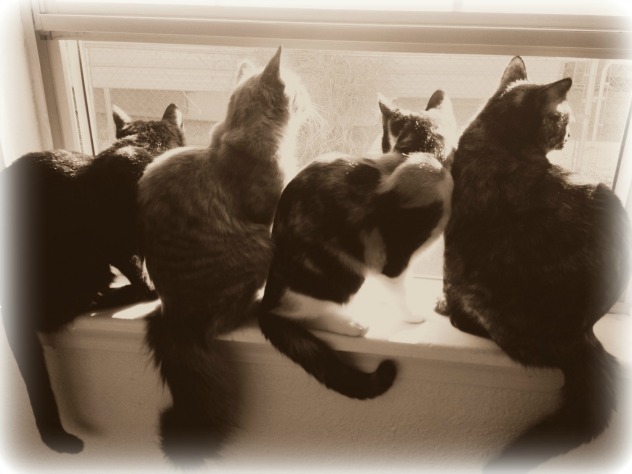 Keep your cat indoors to avoid exposure to infected cats, rodents, fleas and feces. Make sure your home, yard and pets are flea-free with Earth's Answers No More Flea Powder. Practice good hygiene and wear gloves when changing cat litter or handling feces. It’s also important to frequently dispose of stool. Use Earth's Answers All Natural No More Cat Worms daily.